Perusing a recent issue of Grazia magazine I was very interested to see an article entitled Shock Rise of the 'Barbie Waist' as I have been researching this very topic after conserving specimen N.192. 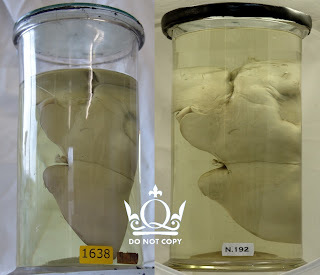 This is an interesting pot particularly in light of the Victorian Body Parts Conference to be held in the museum in September. In fact they even have their own fascinating 'tight-lacing' post with video footage on their site here. However the jury is still out as to whether or not this damage is caused by corset-wearing. Corsets were a popular addition to female attire from the 16th Century onwards, introduced from Italy to France by Catherine de Medici. It wasn't until later they became an integral part of every woman's outfit, and the term 'corset' was used in English around 1830. 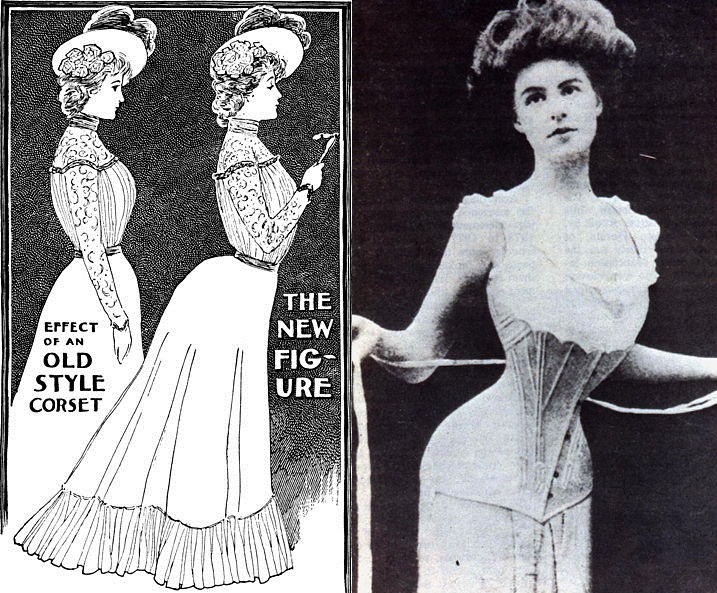 It was 10-20 years after this that 'tight-lacing' became incredibly popular in order to create an 'hourglass' figure. 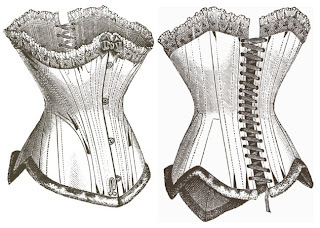 At the time, the medical issues attributed to prolonged corseting included such conditions as 'hysteria' and 'fainting', but the reality is they were causing visceroptosis which is a prolapse or sinking of the abdominal viscera. 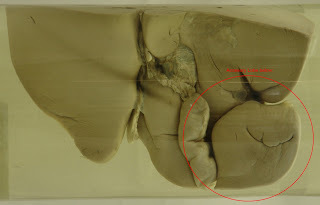 However, visceroptosis is also caused by pregnancy. The corsets were, in extreme cases, leading to indigestion and heartburn, constipation OR diarrhoea, headache, vertigo and much more. 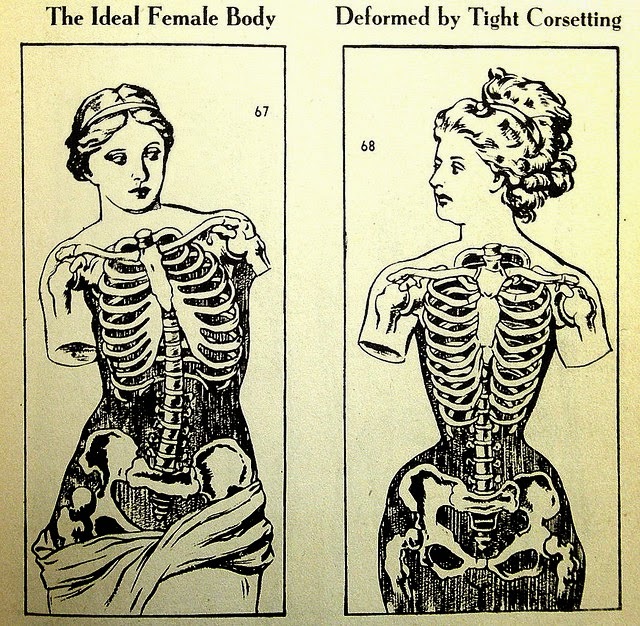 But if these symptoms had been very common then perhaps corsets wouldn't have become so popular? 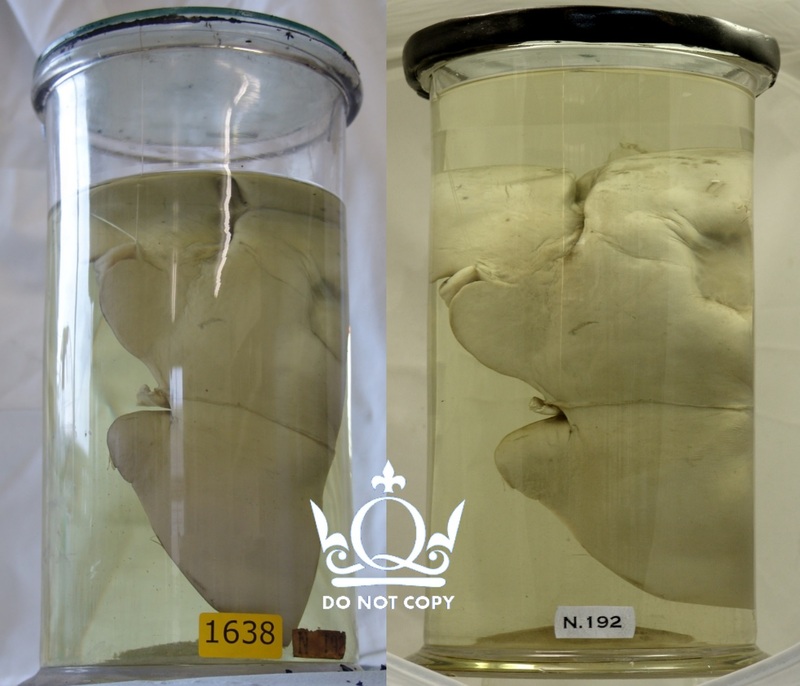 Our female in specimen N.192 had her cause of death declared as 'Chronic Nephritis and Diarrhoea'. She also had chronic renal (kidney) disease, ulcerative colitis (inflammatory bowel disease) and a malignant new growth of the stomach. However, cancer of the stomach is not caused by wearing a corset - it's coincidental that she suffered from this illness. 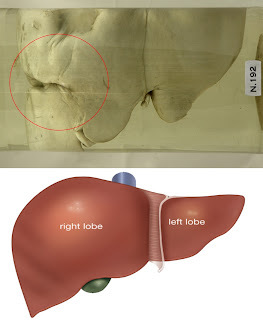 Furthermore, the deformity has subsequently been identified by two different doctors as actually being Reidel’s Lobe or Accessory: a normal anatomical variant that is very rarely seen. We've learned however, via Grazia, that the corset is not yet confined to history and there is a similar article here. A slim waist has once again become a status symbol for young females trying to attain the perfect figure, and despite the dangers cited, waist training is increasing in popularity. 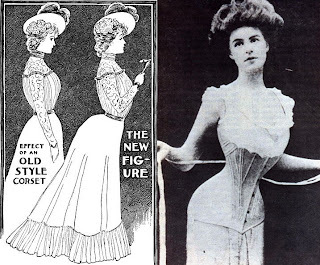 We tend to associate corsets with the Victorian era but they did of course continue into the Edwardian era when the popular S-shape (above) became a new female ideal. Then, despite the famous Campaign for Rational Dress they became popular again in the pin-up era (late 1940s to early 1960s) as epitomised by the beautiful Betty Brosmer. Her measurements were an incredible 38-18-36! And of course one of the world's most famous corset wearers is currently burlesque artist Dita Von Teese. 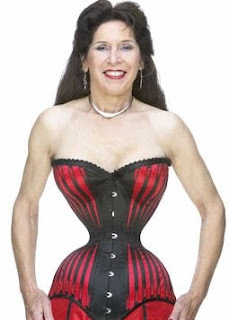 She looks quite healthy and in proportion as her measurements are 32-21-32 but in a corset she can squeeze her waist down to a miniscule 16 inches. However, the current Guinness World Record holder for 'smallest waist in the world on a living person is Cathie Jung who is 39-15-39!! Looking at the above picture I'm not sure the effort is worth it. 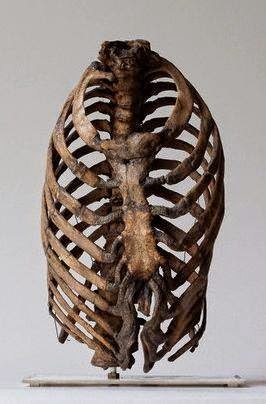 My own thoughts on the subject are that while the corset may well cause deformity to the bones over several years (such as the floating ribs, below) it’s unlikely to cause deformities to the organs, like the one in our collection. In fact, the rarity of that specimen leads me to believe that surely if the corset caused so much deformity this wouldn’t be such a rare specimen?